Scared of Bullfrogs? Get rich (kind of) quick! A few months ago I wrote about some of the heebie jeebies I get from frogs. But, you know, I only blogged about it, whereas this guy, who apparently has a phobia birthed out of an experience of an Italian chasing him in early childhood with bullfrogs in his fists, took his issues with him to court. There the judiciary wound up awarding him ONE POINT SIX MILLION DOLLARS, all because he’s skeered of the springy, lurky amphibians on his property. Makes me feel a bit less silly about my own occasionally creeped-out feelings. Thanks to Donna over at http://gardenwalkgardentalk.com/ for the awesome story. In other news, it’s good to be back. While I was in the Adirondacks, staying a scant handful of miles from this mountain, I jumped back into Spokes and Petals rather suddenly. There was no pomp nor circumstance, simply an acted upon desire to share my boyfriend’s discovery of that still-enchanting rosy maple moth. Obviously I continue to find it tremendously difficult to write during the heat of our growing season (which lasts from march through the end of June) and, as per usual, I will keep striving to figure out ways to keep my writing honed and timely, even when my hands are black from tomato tar and my body forces me to fall asleep before nine. 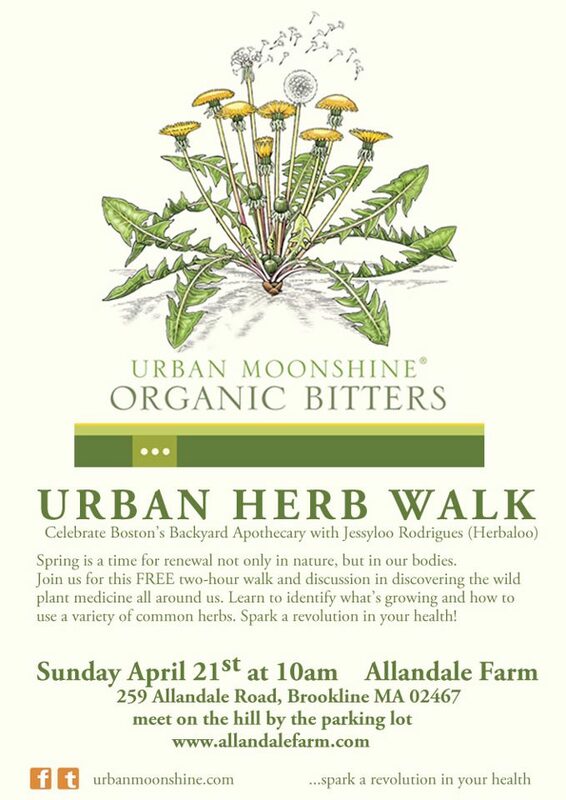 I started up a medicinal herb offering at Allandale Farm, featuring the seeds, plants, and handmade products derived from over 50 of our own medicinal herbs. (I still have a lot that need a new home, so if you’re in Boston and have a bit of free soil or container space come by and give us a look.) A sampling of what I’ve been tending to. Clockwise from top left: resina calendula, mad-dog skullcap, lemon thyme, peppermint, lemon balm, sacred basil (tulsi), and heartsease (Johnny-jump-up). Credit: Helen Glotzer. I went to Wisconsin and learned how to ride a tandem and hold on tight to the back of a cargo bike. Pictures forthcoming. I also danced with my family and friend Murray to THE ZOMBIES as they played a dream-come-true show at Summerfest!!! This song was played and sung impeccably–and was the first thing to yank us all off our feet. I happened upon the Paul McCartney concert at Fenway Park last week. One of my favorite moments in Boston ever: sitting on the sidewalk outside of the stadium with lots of other strangers, smiling my face off, listening to Sir Paul sing “Something,” initially accompanied by a ukulele and brushed drum before blissfully breaking into that sweeeet guitar solo that we all know by heart. Holy holy holy. I started reading The World Without Us. Mindblowing! Matt and I saw our first luna moths (again in the Dacks). Talk about mindblowing. Anyway, it’s been a busy while, but I really am back and am happy, as ever, to be here.